Alicia Frausto, organizer of the Philly chapter of Veggie Mijas, enjoys a Sweet Green vegan salad in South Philly. This story is part of Made in Philly, a series about young residents shaping local communities. On a Sunday evening in February, Alicia Frausto sat at her dining room table for family dinner for only the second time in her life. Growing up in a busy family of six, Frausto had had little opportunity to have a full meal with her whole family at the table. This time, she was in Philly with her friends, not in California sitting next to her parents and siblings. Also absent from the table were animal products. After moving to Philly for graduate school at the University of Pennsylvania, Frausto became the organizer of the Philadelphia chapter of Veggie Mijas, a national collective creating spaces for people of color to talk about veganism that is embracing of all identities and backgrounds often while sharing a vegan-friendly meal or engaging in an activity like yoga or gardening together. 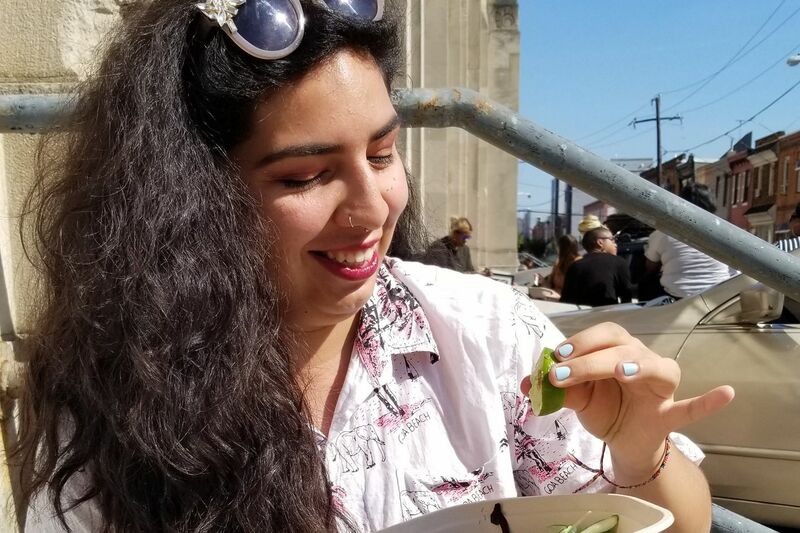 “My veganism is really entangled with other parts of my identity,” said Frausto who is a child of immigrants, Latinx, queer and is low-income. The group of six talked about accessibility and activism as they passed around Rajma, a red kidney bean and tomato-based meal from India; Calabasitas, a recipe from Latinx communities that features zucchini as the main ingredient; and other homemade vegan dishes. Homemade vegan conchas and carrot cake were served up for desert. Since Veggie Mijas’ creation by Brooklyn-based Amy Quichiz in February 2018, events like the one in Frausto’s West Philly living room have been held all over the country through 10 chapters, in places including New York, Washington D.C., Chicago, and California. Growing up surrounded by fast-food restaurants and in a non-vegan family, Frausto was surrounded by meat and people who consumed it. With no one to turn to between the neighborhood McDonalds and the family carne asadas, or cookouts, she felt veganism was not for her. Frausto grew up exclusively exposed to mainstream veganism, veganism that excludes people of color and erases their historic ties to the topic. This concept is also referred to as white veganism. While plant-based diets can be traced to ancient Indian and eastern Mediterranean societies, the word vegan was coined in 1944 by Donald Watson, a British man. The white-washing of veganism, along with the idea that veganism can result in one losing their culture, delayed Frausto’s transition to the lifestyle. She feels these are common barriers in place for people of color when wanting to cut out animal products, but they can be overcome. Alicia Frausto remembers picking up conchas, a traditional Mexican sweet bread, from her neighborhood bakery when she was growing up. Now, she has modified the recipe to prepare her own vegan conchas at home. When Frausto went home to California for the holidays last year, she tried to convince her mother to relinquish the responsibility of making tamales. She wanted to substitute the family’s traditional chicken and pork tamales for vegan ones. Her mother declined. So the two each made the tamales of their preference, vegan with jackfruit and non-vegan, and still were able to bond over the cultural cuisine by comparing their masa and rolling techniques. Through organizing with Veggie Mijas and modifying traditional foods like tamales and conchas, Frausto and other people of color have found a place in the vegan community in the midst of the erasure.